Shinto and Buddhism have generally coexisted happily in Japan for centuries but to the uninitiated it can be difficult to tell your shrines from your temples. Architecture helps. See a torii (two vertical pillars and a crossbeam)? 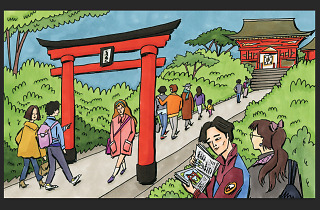 It’s a Shinto shrine (jinja). See a robust gate with doors? Think Buddhist temple (tera). Shrines tend to be open-air, while temples have buildings you can enter (after taking off your shoes, of course). Here are some other basic things to know to avoid a spiritual faux pas. Visiting a religious site in Japan is similar to entering someone’s house: don’t forget to thank your host first. At a shrine, this means bowing to the kami (deities), while buddhas are in charge at temples. A bow-pray-bow routine is customary at both: at a shrine, you throw in a small coin offering, bow twice, clap twice, pray and bow once again; at a temple, you start by offering incense before bowing and praying. Don’t clap at a temple – that’s shrine-speak to signal the kami. 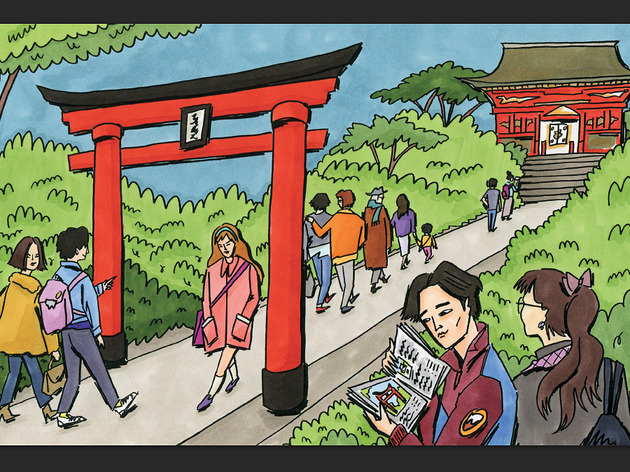 There’s a different Tokyo temple or shrine for almost anything you might need, from finding love and passing your exams to avoiding a car or plane crash. Many of these also sell nifty omamori amulets thought to give you an even better chance of realising whatever goal you’re aiming for – whether it be a debt-free life, a promotion or just protection from computer viruses and cyberattacks. It’s an easy mistake to make, but the communal water basin found next to shrine entrances is not there to quench your thirst: rather, it’s where you cleanse yourself before heading inside. The stress is on communal here – you really shouldn’t be drinking this stuff. What you should do is wash your left and then right hand with water from the ladle, then pour a little water into your left hand, sip it (we normally fake this bit if we’re honest) and then spit it out. Then rinse your hand once more and wash the ladle by holding it vertically before returning it. Yes, you essentially pay to pray, but you’re hardly splashing the cash: common practice is to throw small coins into the offering box (saisenbako), with ¥5 being popular due to its homonymity with ‘good fortune’. In a pinch, a humble ¥1 coin will do. Ooh and aah all you want and pose for a picture near the torii if you insist, but the middle part of the road leading up to a shrine is said to be the path of the gods. Remember that the deities have the right of way: walk at the side of the road to avoid hogging the astral lane or upsetting your fellow pilgrims. Interesting - did not know about the don't walk in the middle etiquette. Thanks for the entry!